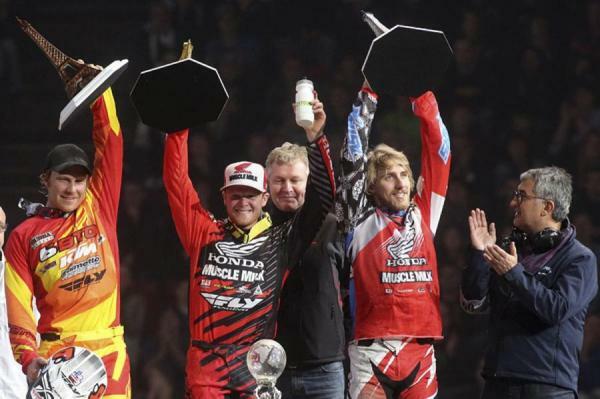 It's all over at Bercy, as the 31st annual Paris Supercross wrapped up with Honda Muscle Milk’s Justin Barcia taking his second career King of Bercy title with a second place finish behind teammate Trey Canard in tonight’s main event. Barcia went 1-1-2 to Canard’s 2-2-1 to clinch the title, and although you might think Barcia was doing the math in today’s main event and realized that he had the title clinched, Barcia says that wasn’t true. Click here for a clip of the action on Day 1. Click here for the main event on day 2. There was plenty of drama before tonight’s main event as Barcia went down in the second elimination race and took Canard down as well when the #41 had no place to go. This left the weekend’s top two racers out of the final elimination race and also gave them the fourth and fifth gate picks for the main event in a race where inside gate pick was everything. BTOSports KTM’s Andrew Short won the final elimination race and also grabbed the start in the main event before yielding to Gauiter Paulin. Short wasn’t done though and passed the Frenchman back and led for some time until Canard (with Barcia not far behind) got the vet. Canard had to come from basically last to first with his bad start and Barcia made a first lap mistake in the tunnels to allow Canard to get by. And from that point, the race was on. As explained on Friday there was a Joker Lane and when Barcia dipped into it, he almost squeaked by Trey but was unable to hold the line. Andrew Short would finish third overall. Canard held it strong for the last few remaining laps and it turned out that Saturday night’s controversial pass on Canard by Barcia was the difference maker for the overall on the weekend. Mission accomplished for Barcia this weekend. If you want to hear some rider interviews from tonight, check out the Pro Circuit Bercy SX Pulpcasts. 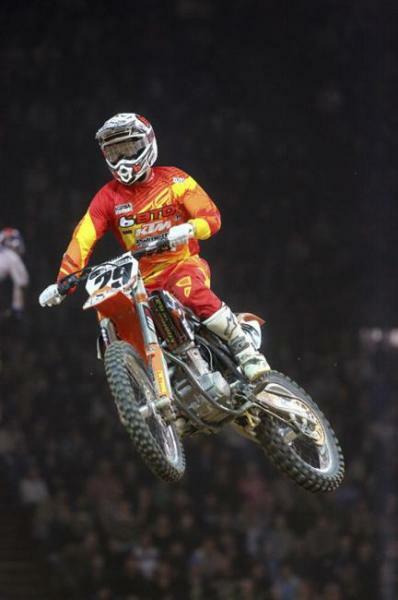 Trey Canard's (middle) win on Sunday led to a second place overall finish. Top Pic: Justin Barcia took home King of Bercy honors for the second time.